For women wanting to relish the joy of a spell bounding beauty of the face and skin, it really is the time to chill out. Wondering how? Well we have just the right news in store for you. Skin icing is one of the brewing beauty rituals going viral for its skin enhancement attributes bound to bring about a difference to the way you look. In case you’re not familiar to the custom of chilling up your beauty, it is worth knowing that cold skin therapy is one of the best skin treatments used since long in spas and luxury beauty salons for improved skin care treatments. They are deemed to be ideal for combat anti aging signs and other skin issues to give you that gleaming and spotless look of youth you so envy in others. The concept takes inspiration from the use of extreme cold temperature of ice to destroy fat cells on the top skin layers as done in the process known as cryotherapy whereby; extreme running temperatures are used to simmer up fresher layers of the skin by destroying fat cells. Though you can get a professional cold therapy treatment by a specialist; yet beautifying the simple and economic we can pretty much get a great deal of improvement results with normal ice from the fridge. Wait until the cloth begins to feel wet. (If you are comfortable using ice directly without wrapping it up, you may proceed to do it). Gently rub the ice cubes all over your face in circular motions focusing to give upward strokes that should trace the jaw line upwards covering the cheeks and forehead. Also, hold the ice cubes on different areas for about one minute; giving each area sufficient exposure to the coldness to attain benefits all over. Do this for at least 5-10 minutes every morning. End your icing session by applying a skin toner or a moisturizer to keep the skin soft and supple. HANDY TIP: In order to make this method an even more effective, you can mix lemon, green tea or rosewater in to water that you will use to make the cubes from. These ingredients are some of the best skin toners known on record ideal to boost the natural health and vigor of the skin texture. Known for boosting and improving the rate of blood circulation, skin icing tends to lower face temperature of the outer skin layers on the face and the body in return responds to balance it up through a better and increased flow of blood in the area. Hence, a daily dose of increased blood flow leads to better and fresh complexion. Cucumbers are known for their excellent soothing, cooling and moisturizing skin results and have been one of the best remedies know to treat dark circles. But did you know skin icing for dark circles is even more result offering than the plain use of cucumbers. Yes, that’s right. So how do we get these maximum results? The answer is simple. Mix rose water and blend it up well with cucumber juice. 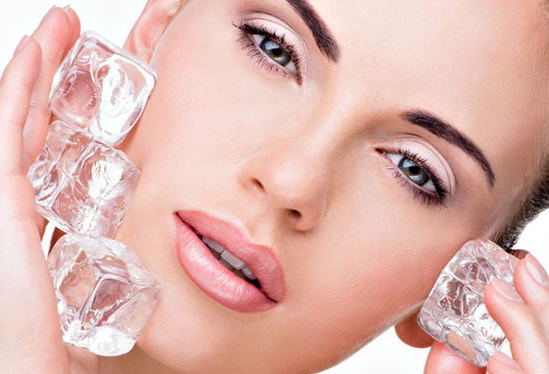 Freeze up some ice cubes from the mixture and use it for skin icing for dark circles just under the eyes. Please not that since the skin under the eyes is sensitive, ensure not to hold the ice cubes at a spot; rather perform a sliding and gentle rubbing motion. A tiresome and enervated look of puffy eyes is simply so frustrating when you look at yourself in the mirror and definitely embarrassing when you go outdoors. Since skin icing is an ideal way to natural heal down the puffed patch of skin under the eyes. With improved blood circulation, it also triggers better development of the sensitive skin to give you fresh looking eyes faster. People often complain about large face pores on their face, which is not only unattractive but also makes your skin loose and saggy. However; that can easily be dealt with right at home. Out of the numerous possible things you could do, icing the face can really prove to be helpful. Cold temperature tends to make the blood vessels in the top layer of the skin to contract and hence it’s a great way of pulling the skin together. Repeated regular sessions of skin icing will gradually make you skin accustomed and make your skin firmer and tighter; hence it’s good by large face pores. This is one of the best summer skin care tip to do in order to enjoy a fabulous looking skin absolutely problem free. If you’re suffering from the menace of pimples and acnes, you can make the best use of skin icing by reducing their size and their risk of leaving behind marks and blemishing. Simply rub the cold cubes on the affected area till it’s numb. Ice it every second night and this will work up to your expectations. Another top skin icing benefit is that it is very helpful for people with oily skin; especially those experiencing the outburst of acne. It comes in very handy to make medicines affect the stubborn pop out better. How? Well, due to inflammation and swelling the medicine cannot reach the clogged and infectious pores. With skin icing you can cut down the intensity of the inflammation and clear the way for medicine to penetrate and take effect. Sunburns are a common issue; especially during extreme temperatures and it pretty much undermines the whole facial appeal. Skin icing is one of the best ways to treat sunburns and clear away the discolored look by cooling and relieving the irritated patch of skin instantly. It also lessens the pain; if any and tends to minimize the chances of any residual blemishing or scarring. You can also use this icing treatment for heat rashes. With a healthy complexion, you can most certainly expect to get a glowing beam of freshness and glow on your face. Increased blood circulation pumps in health and along with its comes an improved radiance that perks up vigor in your skin texture. For numerous reasons like skin problems such as acne and pimples etc, you can have inflammation and swelling on the face. Lessen their appearance is one of the benefits skin icing can give you. The coldness tends to restrict the blood vessels and so there is less blood flow towards the outer skin layers; hence reduction in swellings. A firm and tight skin is reflective of youth and if you want to show off a look less than your age, then it is worth knowing that one of the best advantages of skin icing is that it helps to unclog large facial stomas and shrink their size. The upshot is tighter and firmer skin with a toned out texture simply loveable. Though skin icing has these numerous benefits to offer, yet you must keep in mind not to overdo it while using it as that at times can be problematic . Use maximum two cubes for your daily session which should not be more than 15 minutes.